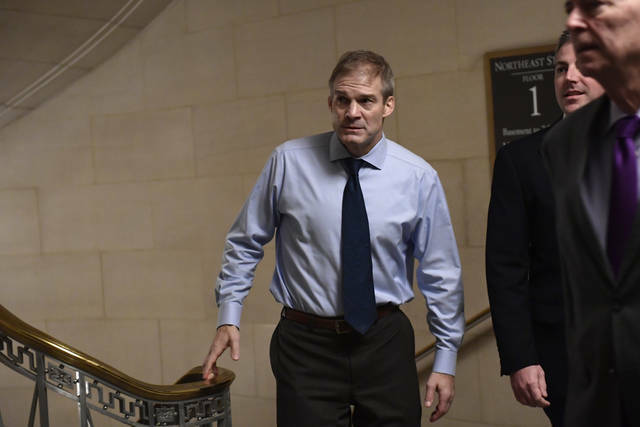 Rep. Jim Jordan, R-Urbana, arrives for a meeting on Capitol Hill in Washington, Wednesday for the House Republican leadership elections. WASHINGTON — House Majority Leader Kevin McCarthy easily fended off a challenge from Ohio Rep. Jim Jordan Wednesday, becoming House Republicans’ choice to become the incoming House Minority Leader. Jordan, an Urbana Republican who leads the ultra-conservative House Freedom Caucus, received 43 votes to McCarthy’s 159 in a closed-door meeting of House Republicans. While Jordan is viewed by some in his caucus as a legislative bomb-thrower, his allies argued that his fiery support of President Donald Trump and his scrappy conservatism would be a strong asset for Republicans hoping to win the House majority back in 2020. Jordan, in an interview after the vote, said he knew it was an “uphill battle” to unseat McCarthy, who has been a member of the Republican leadership team for nearly a decade. The last Ohioan to attempt to lead his caucus was Rep. Tim Ryan, a Niles Democrat who unsuccessfully sought to unseat then-House Minority Leader Nancy Pelosi in 2016. Before that, Republican Rep. John Boehner of West Chester served as House Speaker from 2011 to 2015. “The lay of the land is never easy when you take on the team in place,” Jordan said. He said his focus now was on working hard and winning back the majority. He neither confirmed nor denied reports that he would seek the ranking member position of the House Judiciary Committee, a role that would make him Trump’s chief defender should Democrats attempt to impeach him during the next Congress. Jordan said as he made his case to be minority leader, he asked a few fundamental questions: Why did Republicans lose the House majority? What’s the lay of the land in the next Congress? What do we have to do - what changes were necessary - to win the House back? Among those speaking on his behalf in the closed-door meeting of House Republicans was Rep. Warren Davidson, a Troy Republican. In an interview after his remarks, Davidson said he emphasized Jordan’s role leading the Freedom Caucus. Davidson said in the week before the election, he traveled to Cleveland with Jordan for a Trump rally. Walking out of the arena, Davidson said, Jordan was mobbed, with people getting out of their cars to come talk to him.